It’s a common saying that breakfast is the most important meal of the day. It jump-starts your metabolism and gives you the energy you need for maximum productivity. The problem is that common breakfast foods, like pancakes, are rich in sugars, fats and refined carbohydrates, making them a guilty pleasure more than anything else. Fortunately, Bariatric Health & Wellness offers a high-protein blueberry pancake mix that promotes weight loss and healthy living. We’d never make you choose your vibrant health over such fluffy, delicious decadence – only because there’s no need to. With these healthy pancakes, you can have both! One serving of our blueberry pancake mix has a total of 15 grams of protein and only 90 calories. Enriched with egg whites, whey protein and milk protein, this healthy breakfast is sure to kick-start your morning with a bang. The reason why a high-protein breakfast is great for losing weight is due to not only how full they make you, but how they aid in fueling your metabolism as well. High-protein breakfasts can help you burn more calories and manage your appetite throughout the day. It’s a breakfast that carries you all the way through lunch and even dinner! Eat these healthy pancakes as a meal replacement, and you’ll notice yourself making healthier food choices and curtailing your mindless snacking habits throughout the day. Just remember that your high-protein choices should be smart ones. Proteins with excess fats, like red meat and full-fat cheeses, for breakfast may outweigh the advantages mentioned above. 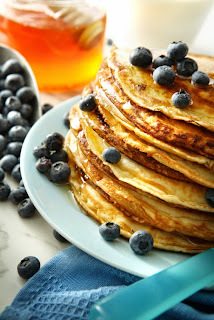 Thankfully, our light and airy blueberry pancake mix holds a mere 1 gram of fat (0g trans fats) in a full serving! 1. Preheat your nonstick frying pan on low heat. 2. Pour the contents of one pancake mix packet into about 3 ½ tablespoons of water and stir. 3. Pour the mixture into the pan, and cook 2 minutes on each side. Get your day started with this healthy breakfast and put yourself in position to make more health conscious decisions throughout the day. It’s seriously as easy as pie! Scratch that. As easy as pancakes!